Wouldn't it be great if a lack of iron was the cause of fatigue? my lack of concentration? What if these things are not a symptom of my MS? It would be so great. It would be like a Christmas present! Ferritin, a neat little protein found in your body (in particular in your liver and your spleen) binds to iron, creating a "storage facility" for iron. Your body needs a particular amount of iron to function, and then the pack-rat ferritin protein, holds the excess. Thanks to my inquisitive nature, I decided to ask WHY the hematologist wants to test my blood every three months. Not having met the doctor yet, and already giving him two blood samples, with two more to go before we meet in December, I phoned his nurse. I have the lowest acceptable level of ferritin in my blood. I was first aware of low iron in August, following Appy-Gate. I took an iron pill, and that was it. No one has followed up on this, and I quite frankly, have thought nothing of it. 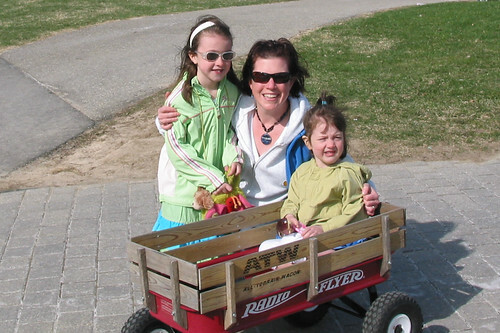 I have been so quick to blame my feelings of "blah" and "fatigue" on MS. Wouldn't you? MS doesn't mean that I am immune to other illnesses. This is evident by all the specialists that I have seen, as arranged by my MS doctor, the hematologist included. Yesterday, was the big day, and I made it. 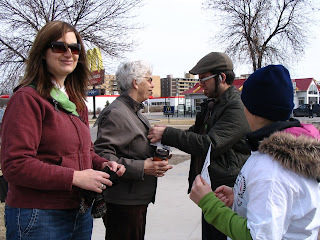 Our 6km, Manitoba Lotteries Walk for MS was held in its *NEW* location, as a merging of the two walks normally held in the city. I would say, that for me, and my team, "Em's Slackers", it was a great day. Although lower in numbers, and total funds raised, we recruited some new team members, and I set a personal high in funds raised. 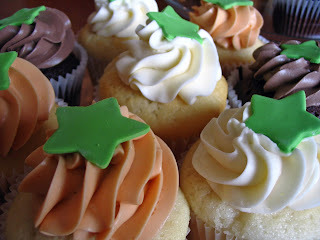 We even tried out a new cupcake flavour at our after-party! Local radio personality, Ace Burpee, kicked off the event that brought out approximately 3,000 people. Although I don't normally listen to him, I thought that he made for a motivating and entertaining start to the day. He even personally complimented our "cool, co-ordinated gear...that's awesome...you've even got hats"! More so this year, than in the past (likely because of the merging of two events, creating more people), I was more aware of visibly younger people with walking aids. Every time I moved past someone with a cane, a walker, or a wheelchair, I thought...someday, that could be me. Am I passing this person while using patience and respect? The race is to cure the disease, not finish the walk. My bottom lip is trembling. Or at least it feels like it is, and it's been this way for two hours. Don't know what it's all about, but I'm also fatigued. This isn't starting out to be a good day for me. Immediately, I start to think about tomorrow, and whether or not I will be able to walk the 6km. And then I think about my plans for today: dusting, sweeping, beading, general home organization and tidying. I snuggle into Jason for a hug (because I get clingy when I'm fighting the fatigue), and I apologize for being useless. I need to find the line between personal expectation, acceptance, reality, and "it's ok to be me". This is not tired. This is not lazy. This is not procrastination. This is being a person who is hard on herself: to do the right thing, to not make mistakes and to be responsible. This is being a person who cares about pleasing others, making others comfortable, and always putting the best foot and face forward. This is a person who sets it in her mind what would be disappointing for everyone else, and tries her best to avoid it. This is all of the above with a main course of MS, and related symptoms. Yes, I said that I decide what would be disappointing for everyone else. Another way to put that, I assume reaction and expectation. I need to stop that. How energy zapping! How defeating! geesh. This is a good rule for everyone: never assume what another will do or say. My bottom lip is quivering, someone is standing on my chest, I can't stand in one spot without searching for something to hold on to/lean on...and that is today. I became a "wanna-be-greenie" when I entered University, 15 years ago. 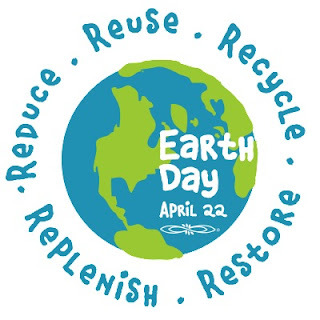 Sadly, I am not overly "green" these days, but I am aware, and try to make conscious decisions and efforts. My first green efforts involved helping to promote recycling within my University dorm, and attending weekly meetings where we discussed "green" and "earth" happenings. I wore t-shirts with funky graphics and slogans telling everyone how much waste we produce per year. I still own one of those shirts - "If it is to be, it is up to me", and I get comments on whenever I wear it. I find it hard to imagine that any home is less green than it was, say five years ago. But I know that there are "brown" houses, I live in a "brown" city (our energy consumption went UP during earth hour earlier this month), and now I see that I live in a "brown" province. A "Report Card" released today shows that British Columbia is the "greenest" province when the following trends are measured: water use, waste management, biodiversity, energy consumption and transportation. So how am I "green" now? If I make this list one year from today, I hope that it will be a little bit longer. 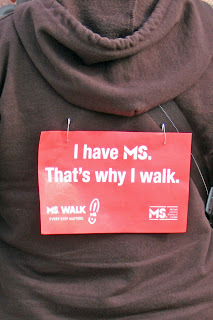 MS walk, originally uploaded by emmsgems. Hey - look who walked for MS?! That's Sixpence (formerly known as Nickel), Annie, and 3 Cent (formerly known as TwoPenny) ! I have been going through thick brain fog, which in turn causes me emotional distress. Lethargy rules my days (not to mention headaches). I can't seem to work out complete thoughts and plans, and I feel as if I am accomplishing nothing, day after day. But you wouldn't know it to look at me. I don't like the invisibility of this disease. I don't agree with how people compare and judge people (and their relationships) who live with this disease. If you have this disease, or have read about with any attention, you would know that no two people experience it the same, and along with that, personal reaction to aspects of the disease are different. There is no "we all have the worst symptom" club...because what is the idea of the worst symptom for one, is not the same as the worst for another. 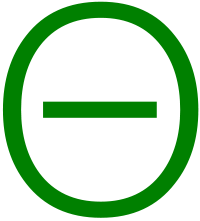 And with that, there is no general, "worse off than another", for those suffering with relapsing remitting MS. There are no "relationship rules for those living with MS". Hmmm, where did that come from? What I just said are reactions that I have experienced lately: about things that I have heard, been told, and read. I'm no longer wondering the meaning is to my life; I'm not searching for my purpose. But I am looking for some control and I'm forever fighting with my own expectations of myself. Expectations of myself...totally within my control. Today, I went to Curves. I haven't been since July, despite my spirit being willing. I think that if I remind myself of my goal: I want increased flexibility and strength; then I should be able to go on a regular basis. Such a goal should be easy to achieve and maintain, with little room for disappointment or failure. I know that it sounds random and unstructured, but that's what I need. 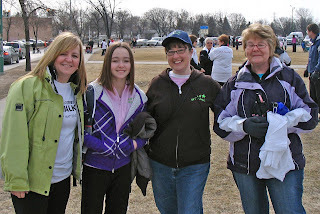 Manitoba Lotteries MS Walk is fast approaching...Sunday April 26, to be exact. Our team lost a couple of members this year, due to previous commitments. I hope that they will return next year. We also picked up a handful of new members...most exciting. Our new members are family members. If you have read back in my posts, or followed me for some time, you will know that the Walk means a lot to me. It is an emotional day and event. To have people wear the Em's Slackers colours within that mass of people, is important to me. For me, it represents not only support for me and MS, but also support for Jason. Speaking of support, Phil Keoghan has completed Day 18. 1700 miles. 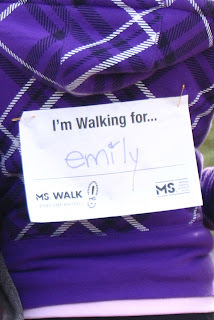 Em's Slackers is the name of the MS Supercities Walk team of Emily Fryer, also known as, emmsgems. 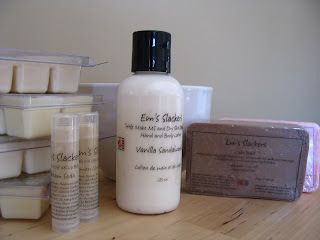 Sales of selected bovinebubbles products and scents, made directly through Emily, go towards the Slackers donation to MS. If you would like to purchase some products, including Help Kiss Off MS! Lip Balm, please email Emily at gem_s [!at] mts.net. Orders must be paid for using PayPal at the time of order. All product will be shipped within the first couple of weeks of May. So from here, I would like to pay homage to the remnants of the fire, the product of the liquid gold...My little red dots. 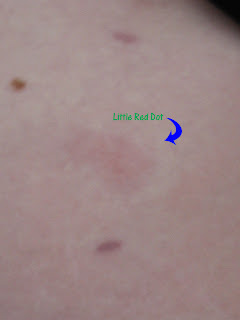 Oh little red dot, I see that you have returned. I barely noticed that you had left, and here you are again, poping up in between my scars, squeezing in amogst my freckles, reminding me of days (and sometimes weeks!) gone by. I am a member of your club. I am a follower of your dreams. Now, red dot, would you mind keeping our relationship on the low down for tank top season? Really, must you be soooo flashy? If you are interested in purchasing any of these items, please visit my Etsy shop to contact me. In my shop, you will find a "contact emmsgems" option on the right side of the screen, with my other info. I feel that there is a large untapped market for donations. While I would prefer straight donations, I am hoping that the sale of these products will compliment our total dollars raised. come on, this is normal. right? I had been sitting on the couch, feet up on the coffee table, laptop...on my lap, when it was time to get up for some reason that I still can't remember. I stood up while holding on to my computer. I made a motion to turn to the end table, in order to sit put my laptop on it. I remember it feeling like I was in a slow-motion video: me trying to set the computer down, so that it didn't fall off the table, or knock over the glass of water that was also on the table. I didn't utter a sound. I was WAY out of sorts. My left leg was crumpling below me. And just like that, I was lying on the floor. Analyze away. I did. I got up slowly, and walked away. Not a tingle. Not a prickly. My leg felt hollow. Ten minutes later, I did what all people do...I performed neurological tests on myself. Don't YOU do that ? It's normal. Right? Walk heel to toe. Heel to toe. Heel to toe. Heel to toe. Walk on tiptoes. Tiptoe. Tiptoe. Tiptoe. Arms outstretched, like a bird, eyes closed, and touch your right index finger to your nose.